The Three Castles, Defensive Wall and Ramparts of the Market-town of Bellinzone are the well-preserved remnants of a defensive stronghold guarding a main pass in the Alps. The earliest constructions that have survived date from the ca. the 10th century. During the remainder of the Middle Ages, the fortifications and town expanded. Also, two-thirds of the original Town Ramparts (with towers) and a defensive wall called La Murata are part of the designated area. The site's world heritage status was held back at the first discussions in 1999: the restorations "seemed to favour the picturesque to the detriment of authenticity". Arriving by train from Locarno, Bellinzone's trademarks are not clear at first sight. It's a pleasant walk though down the Via Stazione to the elegant city center. Within a couple of minutes we found ourselves in front of the lift that goes up to Castelgrande. This lift was seen as an "acceptible concession" by ICOMOS to the site's authentic appearance, but the rest of the restorations were executed a bit too well to the taste of this Advisory Body. What really struck me were the perfectly even stone paths: a huge difference from the interior of the last major castle I visited (Spissky Hrad in Slovakia). The inner courtyard of Castelgrande also holds a restaurant and a sculpture garden, but that doesn't deter from the impressive sight of this castle's high towers. We walked down from Castelgrande using the main road. A very nice walk, passing beautiful houses. This road ends at one of the central squares (next to the lovely Town Hall). Next goal was Montebello, another castle that can be reached on foot. This is a much tougher walk and I had to leave my mother (whom I was travelling with during this mini-break) half-way - where the railing ended. I climbed on, and found Montebello to be more of a 'real' castle than Castelgrande. The third castle (Sasso Corbaro) was meant to be the last stop on our rounds, but we had trouble finding a direct bus (and were too afraid having to walk any distance in the scorching sun). So we settled down at a terrace in central Bellinzone for a filling salad, and then went to the south of the town. After another rest in the garden of the Villa dei Cipressi, we ambled on to the Santa Maria della Grazie church. I had seen postcards of its interior which looked spectacular. The church exterior (15th century!) almost looked too new to be true, but the iconostasis and the frescies in the inner courtyard totally made up for that. A sight surely not to be missed when visiting Bellinzone, and a welcome change from the medieval castles and walls. My wife and I visited Bellinzona as a day trip from Lake Como in September 2017. We visited the uppermost castle first, enjoying the views up and down the valley. From here we drove down to the middle castle, where we left the car to explore and walk down to both the town and the lowest castle. All three are in good condition though as others have mentioned, they've definitely been "enthusiastically" restored in places. We definitely enjoyed our visit though! As a side note, it's incredible how Italian this area of Switzerland is, we really couldn't tell that we weren't in Italy at all! See the link below for my full video review! 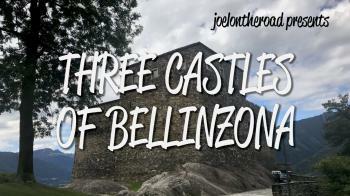 If you are looking for an early version of a toll booth, the castles of Bellinzona should give you a good idea. They were built at a strategic location, a narrow alpine valley, through which multiple alpine trading routes passed. At its height in the 15th century the fortifications cut along the full width of the valley enforcing the collection of tolls for all traders passing by. The main castle, Castelgrande, sits right in the middle of the valley on a hill. The panoramic views you get with the Alps as backdrop are breathtaking. Already the Romans had built a castle here. The two smaller castles rise up from the valley on two neighboring hills, with Castello Sasso Corbaro on top. I would assume these were build to protect the flanks of the main castle and the profits the toll booth brought. During my visit I managed to see the two lower castles, i.e. Castelgrande and Castelle di Montebello. Admittedly, Montebello feels more authentic, but I had little objection to the state of repairs of Castelgrande. This is the second trip in a row that ended with me climbing castle walls. Both times I really enjoyed the experience. With very limited knowledge of military engineering, I would argue that the English castles in Gywnedd are superior to their Swiss counterparts. Bellinzona is well accessible by train. The castles are within walking distance of the station, albeit some climbing is required, specifically if you want to see Castello Sasso Corbaro. Multiple WHS are nearby. Monte San Giorgio can be reached by local train, but may require an extensive hike from the train station in Mendrisio. Near Como and Varese you will find two of the Sacri Montis. Finally, on the Lago di Varese you can enjoy more Pile Dwellings if you are into that. Milan is also connected by direct train and from there all of Northern Italy with its plentiful world heritage sites opens up to you. If you are having problems getting an Italian ticket in Switzerland, the Italian rail website is really easy to use, so you can buy and download a ticket there. Entry to the castles is free for holders of the Swiss Travel Pass. Some areas are free for all in any case, e.g. the premises of Castelgrande. By coincidence I got to traverse the Gotthard-Basis-Tunnel, the longest railway tunnel of our time. The old town and the baroque church are a nice addition to the site. An argument could be made to have a separate hotspot for the area. 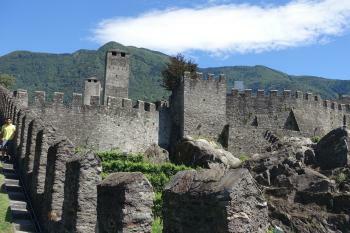 I visited Bellinzona in July 2013. I decided to sleep over to avoid to enjoy the castles lit up at night and to beat the crowds of tourists by hiking early in the morning. Montebello and Sasso Corbaro castles are open from 08.30am so I woke up early and started from Sasso Corbaro. It is the smallest and least interesting of the castles, however at 230 metres, great views of Bellinzona and Castelgrande can be enjoyed. A walk downhill through small vineyards brought me to the Montebello castle, my favourite castle and an all-rounder ... views, architecture and courtyards. 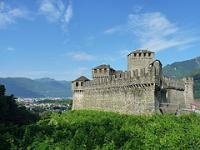 At street level in the Bellinzona city centre lies a huge rocky hill where Castelgrande is perched. It is rather peculiar and you would expect it to be situated instead of Sasso Corbaro. There is a lift that leads to the courtyard but not very interesting to visit. Similar positive experience quite similar to San Marino's Monte Titano. 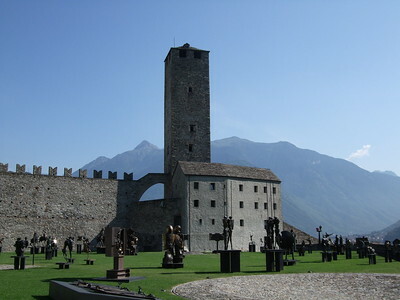 When we were returning from our trip to France we stopped in Bellinzona to visit its complex of fortifications, constructed by the families Visconti and Sforza, that defend the town and the river Ticino valley. The biggest and most ancient castle is Castelgrande, constructed on a rock, that consist in two towers (Black and White), a space divided by walls in three courts, an arsenal, a Redoubt and the remains of the foundations of two chapels. There starts the remains of the Murata, a long defensive wall that crossed all over the valley. The Montebello castle, constructed on another rock, is lozenge-shaped and has a keep, moats and walls. From there start all the town walls, with some towers. The square Sasso Corbaro Castle, constructed by B. Ferrini on a highest rock, consists in a keep and its walls. I was a little bit disappointed by the castles, maybe because I imagined them more decorated, but their architecture is of high quality and impressiveness. They are in a very good state of conservation and their authenticity is very high. They justify the inscription because they are masterpieces of the military architecture and are worth to be visited if you are in the Canton of Tessin. It is easy to reach them because Bellinzona is the capital city of the region and there are some exits on the highway A2. You can park near the centre and you don't have to walk to the top of the hill of the Castelgrande because there are some lifts going there from the square Piazza del Sole in the centre. You can reach by foot the castle of Montebello from Piazza Collegiata, while you can go by car to the castle of Sasso Corbaro from the street Via Lugano. We visited the three castels in Bellinzona several times and decided spontanious to get married in the most beautiful one: Castello Montebello, in June 2003! It is a beautifull place and a wonderful day. We loved our visit to Bellinzone even though we were there in January and on a Monday when they were officially closed. There were no people there and the grounds were open for visiters to explore on their own. It is a very impressive complex of old stone fortifications that are well preserved or restored. I was hoping to find more historical information on this web site since the museum was closed the day we happened upon the castle. The castles and the mountain surroundings are definitely worth a stop. Built in the 13th century: Castelgrande. There are earlier remains.